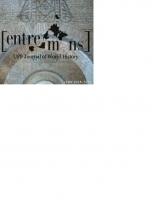 Entremons is an academic journal designed to serve students, teachers, and researchers in world history; its aim is to “promote historical research with a global perspective.” The journal was founded and is run by graduate students in history at the Institut Universitari d'Història Jaume Vicens Vives, Pompeu Fabra University, Barcelona, Spain. Articles may be viewed online in PDF format, downloaded in PDF, or downloaded into Dropbox via the site. Each issue of Entremons offers three to five articles in Catalan, English, or Spanish [recent examples are: “Activistas Budistas Trasnacionales en la Era de Los Imperios,” “Òpera i Canvi Cultural a l'Europa del Segle xix. la Cenerentola o l'última Opera Buffa,” “Populism, Fascism and Caudillismo in the United States: the Case of Huey P. Long,” and “Neo-Malthusianism, Anarchism and Resistance: World View and the Limits of Acceptance in Barcelona (1904-1914)”] along with two to five reviews of relevant books (reviews of Francis Fukuyama’s The Origins of Political Order and Niall Whelehan’s The Dynamiters. Irish Nationalism and Political Violence in the Wider World, 1867-1900 appear in the most recent issue). A brief, unsigned editorial ends each issue. The editorial board consists of doctoral students in history from IUHJVV Pompeu Fabra University, and the editorial board includes faculty from the archaeology and history departments at Pompeu Fabra University. Article authors come from around the globe, and past subjects addressed include the Chinese community in colonial Mexico, Mikhail Bakunin and anarchism, the political philosophy of Fray Bartolome de las Casas, analyzing the concept of iconoclasm applied to Christian and Islamic art, and the paradox of conventional anti-Eurocentrism. As you can see, there’s a wide range of material here, and the variety of subjects along with the diversity of opinions – and backgrounds – makes for an exhilarating read. For a student-produced journal, this title is very well done. I wish it were quicker to view the articles (they can take quite a while to load), but for serious researchers in world history, this is worth the time and effort to access.